Shamrocks are perhaps the most common symbol of the Irish, but Claddaghs can’t be far behind. Americans from all nationalities are familiar with the intricate design, most often seen on rings, but it’s doubtful many know what it represents, much less how to say it. The word Claddagh, pronounced klah-duh, is rich in meaning and tradition. The full Gaelic name actually is fainne Claddagh and symbolizes elements of a long-lasting relationship, specifically friendship, love, and loyalty. With these three qualities, all else, such as respect, compassion, patience, and understanding, are sure to follow. 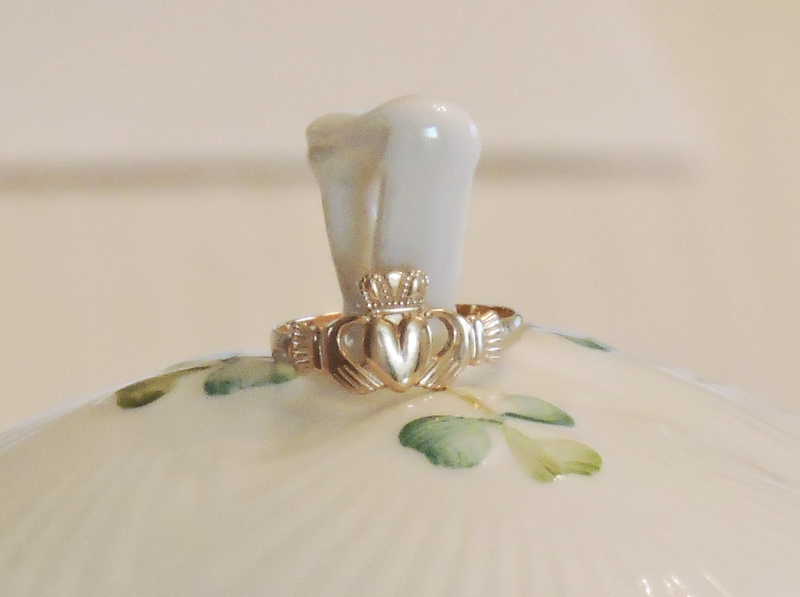 Since Roman times Irish mothers have handed down their Claddagh to their daughters in hopes that they find true love. If you are available and looking, the heart points toward the world and away from you. If your heart has been taken, the ring’s heart points toward you. The story is that the first Claddagh ring was designed by a young man in ancient times from the village of Claddagh, Ireland who was separated from his beloved when he was captured and sold into slavery. While in captivity, he stole small amounts of gold from his master until he had enough to fashion the special ring. When the two were finally reunited, the young man was delighted to find his lady had waited for him. He gave her the ring as a sign of their enduring love. You have it exactly backwards, or you are using terminology that does not describe what you are trying to say very well. The tradition does not speak of where the CROWN is vis-a-vis you, but, rather, whether the HEART points to you or away from you, viewing the heart as a kind of arrowhead. If you are available and looking, the heart points toward the world, and away from you. That would mean that the CROWN (which sits above the heart) would actually be turned so that it is NEAREST your wrist, not “turned away from you,” as you wrote. If your heart has been taken, the ring’s heart points toward you (that is, toward your wrist). That would mean that the CROWN would be in the position farthest from you, on the far side of the heart, not “towards you,” as you wrote. Thank you, Sean, for responding and correcting me.